The apartment may not be desirable in all of its traits---parts of it are made to look ramshackle, not to mention there's a horse living outside the backdoor for a while. 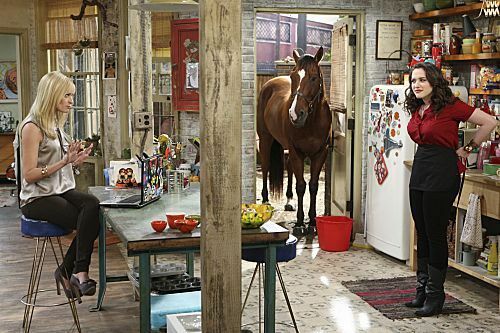 But for two very broke girls, the apartment is bursting with color and personality. There are lots of budget-friendly ideas to take from these girls' apartment. There's no real color scheme to the apartment---it goes to show that you don't always need one to make decor work. The walls are a neutral (somewhat dingy) beige and gray, as the trim is a yellowy shade. The floors are hardwood. The walls are decorated with lots of prints, posters, art, and signs. The furniture is all mismatched---looking like each piece could come from a garage sale, parents' attic, or consignment shop. Accessories give off a retro and vintage vibe, coming from thrift stores. Pillows add a punch of color and pattern to the couch. The kitchen/dining area gives off a colorful vintage feel with a touch of industrial. Open shelving rather than cupboards. An old table rather than a bulky island. Lots of colorful magnets on the very retro refrigerator. My favorite part of the apartment is Max's room. I love how she covered the wall behind her bed in a pretty floral fabric and then made a headboard using three deep blue cushions. Complete with a shabby chic picture frame and lots of sketches, the room looks really cozy. A brushed steel desk lamp and vintage-style alarm clock are cute touches on the nightstand. 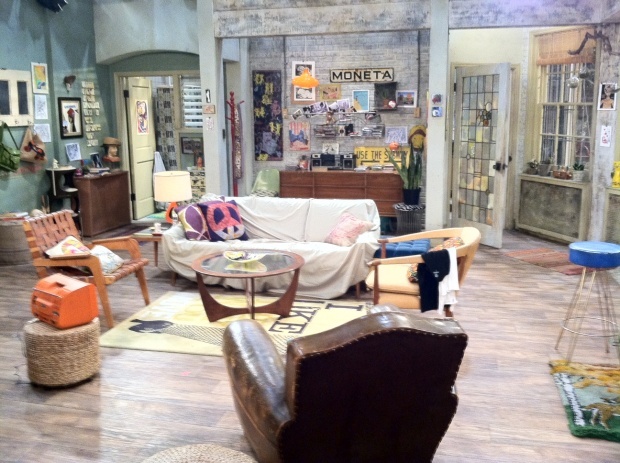 To mimic the 2 Broke Girls' living room, the key is sprucing up thrift-store-finds and hand-me-down furniture. (Perfect for us broke college girls, right?) If Uncle Ned throws a worn out leather chair your way---don't despair! Toss a pretty pillow onto it. Inherit a couch you're not crazy about? Cover it up with more lovely pillows. Play up the eclectic factor. Scavenge antique and thrift stores for retro lamps, candlesticks, artwork, and curiosities. Don't focus on matching colors or patterns or styles. Focus on incorporating things you like. And the more vintage, the better. I love Max's bedroom because it's so creative! Hang floral fabric or wallpaper floor-to-ceiling behind your bed for a pop of color and pattern. Then use cushions up against the wall as a DIY headboard. Max used floor cushions, but outdoor furniture cushions would work great because of their strings. You can tie a cushion to command hooks and hang them. Go for a fun printed duvet. 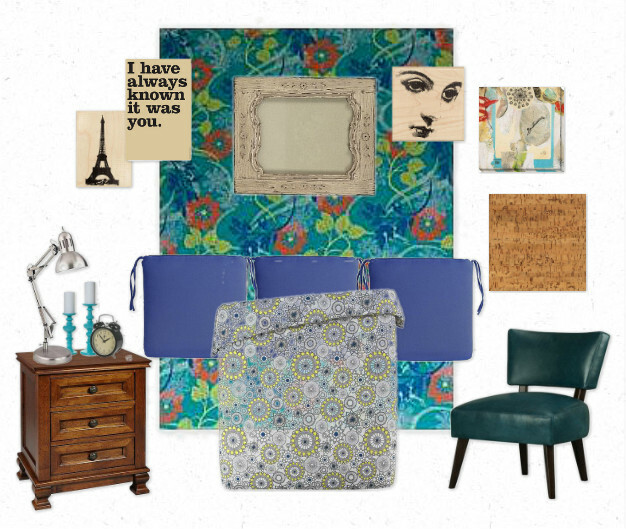 Accessorize with a metal desk lamp, vintage-inspired alarm clock, and chunky candlesticks. 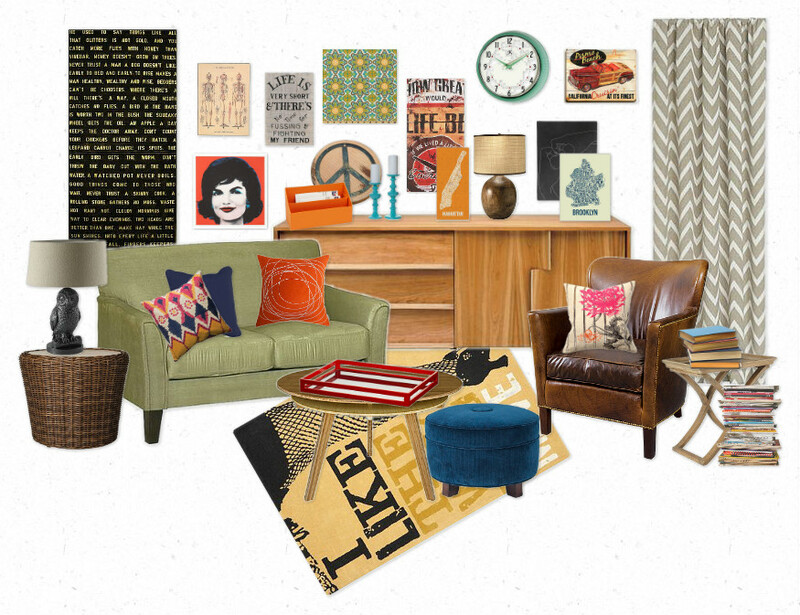 A MidCentury Modern chair would feel very at home in here. Hang a big shabby chic picture frame over your bed for art, as well as lots of sketches and prints. 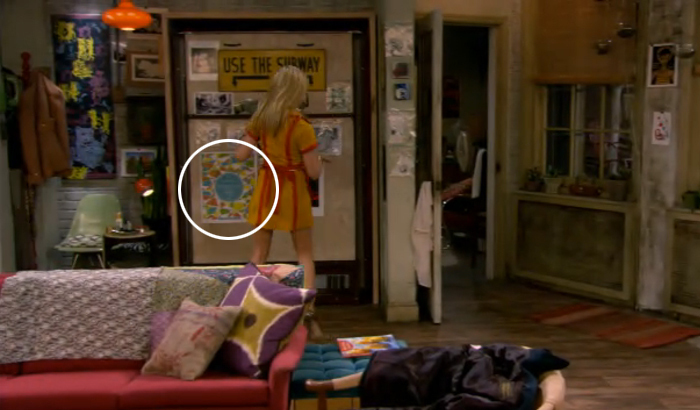 If you reeeeally dig the prints scattered throughout the apartment (check out all the ones with a circle around them) you'll be happy to know that I stumbled across the company that makes 'em. 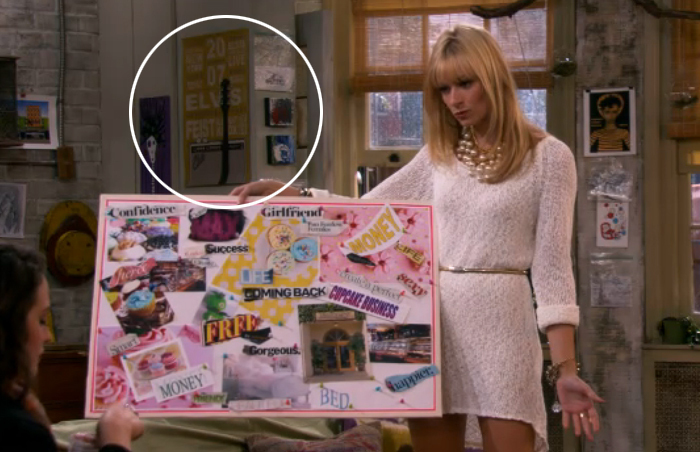 Hero and Sound has lots of fantastic posters and several of their posters were used in decorating the 2 Broke Girls set! I love this show and actually the way Max did her headboard gives me an idea for my own. I don't think I realized quite how awesome this apartment was until I saw that first picture of the apartment on your post with nothing else in the apartment, the colors are great, the layout is great and it's so comfortable. And yes, I agree... I love this show. Would ANYONE know the name of the paint color that is that teal/grey blue shade near the front door entrance. It was also prominently used in the bathroom scene in episode S01E15.And the Blind Spot. I have only seen a couple of episodes of this show but the apartment decor really speaks to me. So much so I Google's for it and found your article. Love the decor! I want the painting on the wall in Max's bedroom. Black cats with the word "Lucky" on it. what is Caroline's bed called how would you describe it does it have a specific name? I am dying to know where to get the butterfly wallpaper in The High Hookup!